In the inaugural session of AirTech ’17, a conference being held at Air University in Islamabad, the Pakistan Air Force (PAF) Chief of Air Staff (CAS) Air Chief Marshal (ACM) Sohail Aman stated that China is supporting Pakistan’s efforts to develop a next-generation fighter, a satellite program and a manned space mission. Having formally launched Project Azm in July, ACM Aman provided additional details of the project, such as 60% of its workforce comprising of civilians and that “it will take five years to initiate the production” of the aircraft (Dawn News). Under Project Azm, Pakistan Aeronautical Complex’s (PAC) Aviation Design Institute (AvDI) was tasked to develop a medium-altitude long-endurance (MALE) unmanned aerial vehicle (UAV). ACM Aman outlined that the AvDI MALE UAV will also be produced in 18 months. Reiterating upon his prior statements of building Pakistan’s domestic industry base and reducing its need for foreign suppliers, ACM Aman reportedly told the audience at AirTech ’17 that the PAF will source the bulk of its weapon systems from Pakistan by 2020. In addition to Project Azm, the CAS revealed that China was also assisting Pakistan in space development. Besides assisting Pakistan in satellite development – e.g. the Pakistan Remote Sensing Satellite (PRSS-1) earth-observation satellite due to launch in March 2018 – ACM Aman announced that China will assist in sending Pakistani astronauts into space in the next two years. Regarding the CAS’ statement of the Project Azm 5th-generation fighter (FGF) entering production in five years, it is unclear if the CAS was referring to serial production or the production of a prototype. However, the notion of PAC collaborating with China on the program was to be expected following the relationship built as a result of the JF-17 Thunder program, which is the mainstay fighter of the PAF fighter fleet. In some respects, the PAF’s messaging regarding the FGF, AvDI and the Kamra Aviation City seems to point towards an original design effort. However, unless the PAF wants to repeat the arrangement in place for the JF-17 (such as China being responsible for engine integration and testing or manufacturing JF-17 prototypes), it would need to make capital investment in aviation development infrastructure in Pakistan. Besides cost, time will also be required to build requisite human resources … to undertake the continual development work. Although the Kamra Aviation City has ambitious goals, Pakistan will likely seek overseas support, and this would be a factor in any originally designed fighter. Given the political and economic realities, Pakistan’s principal partner in this endeavour would be China. Pakistan could accelerate its process by essentially procuring the Shenyang Aircraft Corporation (SAC) FC-31 off-the-shelf with a deep level of transfer-of-technology for local production and customization. In 2016, SAC began testing the second FC-31 prototype, which exhibits numerous changes to the original FC-31’s design, such as revised vertical stabilizers and forward fuselage. The FC-31 is being designed with the export market in mind. In 2015, the Aviation Industry Corporation of China (AVIC) committed to bringing the FC-31 to full operational capability (FOC) by 2024. This would be a risk-averse avenue, one that could see the PAF acquire a potent strike and maritime-capable solution through the 2020s. The alternate scenario would be for PAC to continue its ties with Chengdu Aerospace Corporation (CAC) and to co-develop another FGF design. While this would come later than the FC-31, the PAF could steer it as a long-term solution for replacing the JF-17 from the 2030s (the oldest JF-17s will be 20 years of age by then) and organically build design, research and development (R&D) capacities with China’s support. 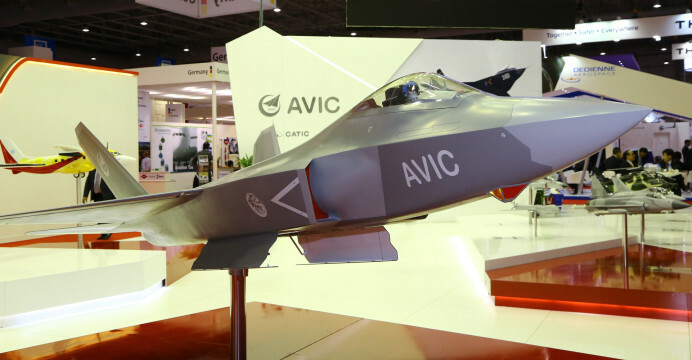 The PAF’s decision to establish AvDI – an entity specializing in aerospace design and development work – indicates a willingness to embrace an original design program instead of acquiring the FC-31 off-the-shelf. The other aspect that could suggest an original design is Pakistan’s aspiration to export big-ticket defence items, including combat aircraft. While a capital-heavy investment, commissioning a new program would see Pakistan own (like it does with the JF-17) workshare and a portion of the profit of third-party sales. It would be premature to dismiss the possibility of AVIC allowing Pakistan to join the FC-31 as a partner if it compensates AVIC for some of the development cost. However, the original development route will see the state’s expenditure feed Pakistan’s own design and R&D efforts, which would help with maturation in the effort and generate valuable intellectual property for use in Project Azm and future programs. Regarding the AvDI UAV, it is worth noting that Pakistan has not availed existing off-the-shelf options such as the China Aerospace Science and Technology Corporation (CASC) CH-5 and/or CH-4, Turkish Aerospace Industries’ (TAI) Anka or CAC Wing Loong. The PAF has not released its required parameters for MALE UAVs, but existing off-the-shelf options occupy a diverse range of capabilities. The TAI Anka, CASC CH-4 and CASC CH-5 have payload capacities of 200 kg, 345 kg and 1,200 kg, respectively. From cost management, risk mitigation, design evolution (based on Pakistan’s prior UAV development efforts) and technology (e.g. propulsion) access standpoints, one could plausibly expect the AvDI UAV to mirror the specifications of the TAI Anka and CASC CH-4. In fact, the Pakistani armed forces have refrained from importing the Anka and CH-4, despite both being offered and noticeable upgrades over existing UAV-based surveillance and targeted-strike assets in the Falco and CH-3A-based Burraq, respectively. Pakistan could be intending to acquire analogous capabilities domestically through the AvDI MALE UAV.